Summary: This bead making item is inspired by an explosion of necklaces by J.Crew. The pattern is actually fabulous and incredible. Want to design your own necklace this summer? Just follow this Beebeecraft simple tutorial! When it comes to this bead making project, the most challenging part is to collect the beads. While the main bib portion consists of an array of oval bead, I recommend using lightweight acrylic bead. Once you have figured out how to place the beads, with the jewelry making chain, the rest is easy! So design your own necklace now. Summary: Boxes, Jewelry tree, on the wall—where are you storing your jewelry pieces? In this Beebeecraft post, we will show you a homemade jewelry accessory-for a DIY jewelry hanger out of an old window screen and backless wooden frame. For most women, storing jewelry may be as simple as putting them away, and later, realizing that you have misplaced them pieces. With this homemade jewelry accessory—DIY jewelry hanger you will be able to showcase your jewelry neatly and show off some personal character at the same time. Step 1: measure the size of your wooden frame and cut enough screen to fit inside the frame. Step 2: clean the wire mesh with alcohol. Step 3: glue the wire mesh to the wooden frame sturdily. Step 4: after the glue has completely dried, you may hang your earrings and necklaces on. Well, you can keep all your jewelry ornaments orderly and straightforward now. However, besides the DIY jewelry hanger there are always plenty of ways you can store and arrange your jewelry accessories. For a homemade jewelry display, the best method may depend on your budget and the space you have available. Just have fun! Summary: Ingenious jewelry ideas on how to turn recycled lamp crystals into scrumptious handcrafted necklaces; they are totally easy to make and can match any type of outfits. Creating jewelry out of recycled stuff is a fun and meaningful way to prevent waste and show your flair for inspired jewelry ideas. At same time you can create a recycled jewelry item to wear that is very low budget. Read on to learn from Pandahall Elite how to make handcrafted necklaces with old lamp crystals. 1st, take a long jewelry wire and slide the bead to the center location. 2nd, twist the two ends beside the hole. Leave a small loop at the top of bead. 3rd, wrap the excess tails around the top half of bead. 4th, tuck the sharp tips among the coils. Step 3: attach the pendant onto the chain. Congratulations! Not too bad, right? Besides using the pendant for handcrafted necklaces, bracelets and earrings, you may further use them to adorn your bags, shoes and even your dresses. Anything from a household object can inspire a large amount of incredible jewelry ideas. Summary: A popular and trendy jewelry idea that demonstrates you how to make bracelets out of string, in a pretty good 12 strand spiral pattern. It may look intricate, the result, however, are worth it! Bracelets made from string materials have been around for ages. Try making this trendy jewelry using hemp or twine is a pass time after work. Here, I will teach a 12-strand spiral pattern, with an assistive Kumihimo round disk. Read on to learn from Beebeecraft how to make bracelets out of string. How to make bracelets out of string? 1. Cut 4 strands of Magenta and 2 strands of Yellow string, about 120cm and 140cm respectively. 2. Fold all strands at center. Tie an overhand knot to form a small loop as part of the closure. 1. Place the knot through the disk from the front. 2. Arrange the 12 strands on disk as the picture shows. 4th, take the right cord No. 2 at top to the right of only cord at bottom to be No. 12. 2nd, take the top right cord No.24 to the right of only cord at bottom to be No.6. 5. Turn the disk and repeat the above procedure 3 and 4 over and over again. When you get a desired length, grab all the cords and carefully remove them from the disk. Tie another overhand knot at the end. Trim off the excess tails and secure the ends by melting them slightly with a lighter. There are many different ways to make and enjoy such trendy jewelry. Learn how to make bracelets out of string to go with every outfit and to give to friends as gifts. With the revival of the bohemian style, string accessories will always be in the mainstream. Summary: This tutorial will aim at teaching you some basic wire jewelry techniques that may help you build your own ring. Make an array of sparkle and stack wrapped rings! Wire jewelry techniques are trendy and widely-used skills to build your own rings. With the use of a mandrel and jewelry making tools pliers, you will be able to create a large amount of stunning wire trinkets. How to start the wire jewelry techniques? Step 1: Measure about 10cm of aluminum wire. Place it around the mandrel at the proper size (near the circumference of your finger). Wrap the wire to create a loop with overlapping ends. Step 2: Take the 0.5mm brass wire, about 30cm long and start wrapping where the overlapping starts. After several wraps, place the crystal chain on top and continue wrapping, only once between every two crystals. Finally, wrap and affix the other end as before. Once you finished the end, cut of the excess wire and you’re done! See, just 2 easy steps for you to build your own ring! Consider making the rings with a variety of wire and beads to accessorize your outfits. Each piece will only take you minutes to make. Additionally, for more basic wire jewelry techniques please head over to our learning center! Mother’s day is coming and do you have any ideal on the gift sent to your mother? Or do something with her? If you don’t know how to spend the festival, then maybe you can get some inspiration from this article. I will introduce the jewelry making tutorial on elegant flower pearl earrings. This pair of earrings is very pretty and i think this will a good choice no matter how you to do, making by yourself or doing it with your mother. That will be all right. First, you should prepare the materials this jewelry making may need in advance. Thread one 6mm pearl bead and one 10mm pearl bead with eye pin and ball pin separately. Thread the two beads together. Add the beads pendant to the flower Cubic Zirconia Stud. This is the final look of the fair earrings. Is that easy? I believe that you will make the best gift for your mother. 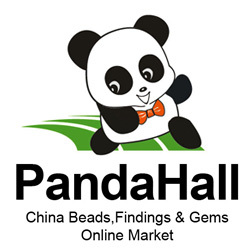 Summary: today i will share some hot sellers about jewelry boxes at PandaHall for you. These products are the top sellers in our website. And many customers have shown that these jewelry boxes are very economic and useful. There are also many customer-show you can see on our station. The first one is cardboard jewelry set box. And the price is US $3.92 / 24 pcs. You can put rings or necklaces. They are rectangle and tan. The size is 8x5x3cm. The second one is plastic beads storage container. The price is US $9.73 / 3 Sets and the size is 13.5cmx16cmx3.5cm, which of the bottle is 26x29mm, 30pcs/box. You can put many seed beads here. And the bottles can help clarify the beads into different colors. The third one is a rectangle jewelry box with 12 storage containers. There are jump rings in the jewelry box as the picture shows. You can also put some earring components in it. The containers are good for classification. There are many tools and materials are hot according to our customer-shows. If you love jewelry making and often buy many jewelry beads or earring components, i think you will need these jewelry boxes, for that they can do help for convenience and save your time.